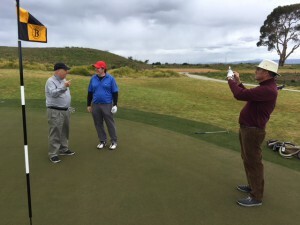 Bayland’s Architect Forrest Richardson, left, talks with Golf Channel’s Jason Deegan while Architect Don Knott fills in as cameraman for the GC website interview. After nearly six years of starts, stops, delays and typical regulatory bureaucracy around environmentally sensitive land, the transformation of the old Palo Alto Municipal Golf Course into the Baylands Golf Links is nearly done. And while the track won’t officially open until late April or early May, a preview with Golf Course Architect Forrest Richardson, who designed and managed the renovation, suggests golfers will find the updated venue well worth the wait. With rolling fairways over ground that was once pedestrian flat, and large and wonderfully complex and contoured greens replacing plain-Jane putting surfaces, the new look calls to mind courses from the Scottish past. But thanks to a modern infrastructure, it befits a 21st Century design that’s wedged between U.S. 101 and the San Francisco Bay, and flanked by the headquarters of Google and Facebook, in the veritable heart of Silicon Valley. In early March I was invited by the affable and always entertaining Richardson to unofficially inaugurate Baylands, along with the Golf Channel’s Jason Deegan – – who frequently writes about course architecture – – and the veteran locally-based Golf Course Architect Don Knott, who spent many years with Robert Trent Jones Jr. and has more than 80 worldwide designs to his credit. We had the rare opportunity to launch shots from fairways without a single divot, and onto greens untouched by ball-marks. Putts ran fast and true on the upgraded surfaces. 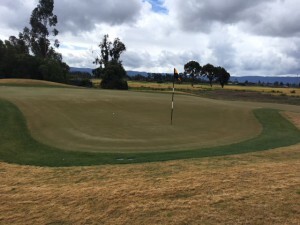 The steep contours of the seventh green could make it the most “controversial” on Baylands. lowest areas were planted with native trees and grasses. The most significant aspect of the $12 million project was the 500,000 cubic yards of soil trucked in from a construction site at Stanford University. “Smart dirt,” notes Richardson, which raised the elevation of the course by five to seven feet. In a long career as a golf course architect, William P. “Billy” Bell designed some 55 courses, including the Bel-Air Club, the Stanford Golf Club and Riviera, along with numerous other private and municipal facilities, including Palo Alto. I don’t know what Palo Alto looked like when it opened in 1953, but when I played it in the mid-1970s, the Muni was more a routing than a design. Unmemorable adjacent fairways fed into unmemorable greens. The only lasting image of Palo Alto was of the runway of the nearby general aviation airport. The Muni clearly suffered over the decades. During the 1980s it began to subside and sink below sea level. In the 1990s, many tons of sand were brought in to raise it a few feet, although soggy conditions frequently prevailed. Parts of the course were taken out of play. The popular restaurant next to the Pro Shop remains the epitome of 1970s design. The third and 15th holes share this very large green. Bay,” instead of what was an artificial tree-covered parkland. 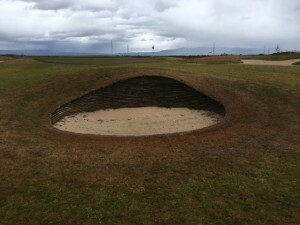 One of the two revetted Durabunkers on Baylands. While the base beneath most of the bunkers features the Better Billy Bunker system, two are made with the Durabunker system, recycled materials stacked like the revetted sod pot bunkers of Scotland. 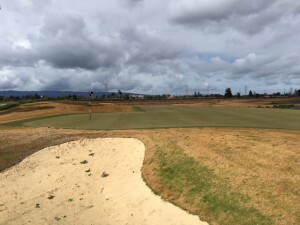 Also different are the 80 acres of fairway and rough planted in Platinum TE Paspalum, a grass that goes dormant and turns brown in winter, the first use of its kind in Northern California.